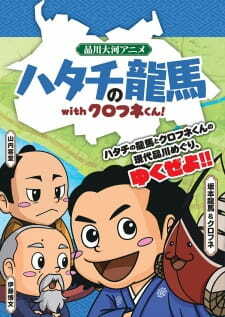 A Shinagawa ward tourism anime. The anime was made in honor of the 150th anniversary of the Meiji Restoration. It stars Sakamoto Ryouma, a historical figure who took part in overthrowing the Tokugawa shogunate. He spent most of his youth in Shinagawa under the Tosa Clan residence and a statue of him was erected in his honor. He's considered a hero of Edo and worked as a cost guard/battery staff when Commodore Perry landed in Japan with black ships. Here, the anime has a young Ryouma encounter Kurofune-kun, a black ship chibi mascot, as they time slip to modern Shinagawa. Kurofune-kun shows him the sights and they meet other historical figures who time slipped.